You can send flowers from Kim's Creations Flowers, Gifts and More to any hospital or care facility listed below. Please refer to this list for the names, addresses and phone numbers. Did you know flowers have healing powers? Don't just wish someone a speedy recovery; encourage it with flowers from Kim's Creations Flowers, Gifts and More delivered to the hospital. Flowers delivered to the hospital will create an atmosphere of beauty and tranquility for the patient. 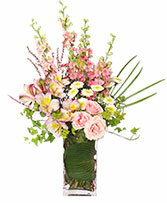 It is easy to send flowers to the hospital by calling Kim's Creations Flowers, Gifts and More. Just follow a few hospital flower delivery guidelines. 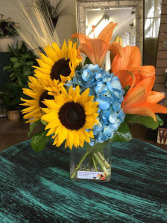 To help you find a Forney, TX hospital or care facility, Kim's Creations Flowers, Gifts and More lists all the hospitals they deliver flowers to. Delicate, classy and sure to bring a smile. 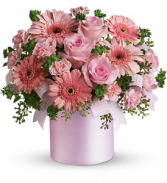 This modern design in pinks can is a year round hit!